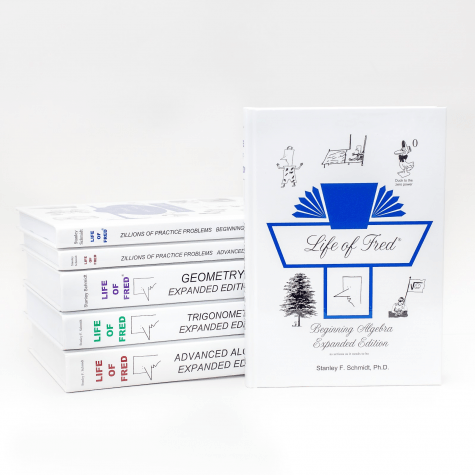 Have you chosen Life of Fred as your home school math curriculum? If so, give us your review. Tell us about it here. Looking for a different home school math curriculum? Read the description below written by the author, Stanley F.Schmidt. Life of Fred is fun. Life of Fred explains the need for math. Life of Fred is inexpensive. Life of Fred is clear. Life of Fred is complete. Let's look at each of these five points. First, it's fun. A mom wrote emailed me August 25th: "I just discovered my son working on his 8th math lesson of the day--at 9:15 p.m.!!!" Another mom wrote (August 27th): "I received my copy of Life of Fred: Fractions today. Well actually I bought it for my daughter but I am enjoying it first. . . . Hello? Free shipping? I wanted to buy every book now before you changed your mind." On August 4th: "I have just finished Life of Fred: Decimals and Percents. Mum is always telling me I can't do more maths, because I always want to keep reading Fred's story instead of my other school work." When is the last time you wrote to an author of a math book saying how much you liked it? If you visit our Web site PolkaDotPublishing.com and click on the Raves from Readers, you can learn what others think about the Life of Fred. No other series has gotten this kind of response. Second, every math teacher gets the same question: "When are we ever gonna use this stuff?" Fred answers that question. He is born in one of the books and grows up through the books to the ripe old age of six. In his everyday life he first encounters the need for some piece of math, and then we do. Every part of math--from factoring in beginning algebra up through hyperbolic cosines in fourth semester calculus--every piece of math is needed. Third, just before I wrote this, I went to Amazon.com and typed in the search box "beginning algebra." The first hardback book listed was $107.73. The second was $120.76. The third was $121.20. Then $107.73, $130.67, $138.47, $108.60, $123.12, $108.97, $123.12, $130.67. . . . Yikes! Where does Life of Fred: Beginning Algebra and its hardback study guide, Fred’s Home Companion: Beginning Algebra fit in? The pair of them together are $43 and I ship them by first-class Priority mail, and I pay all the postage. The whole Life of Fred series (now includes 18 books!- including 4 answer keys), which takes the student from learning about fractions up through two years of college calculus and a year of college statistics, is $415. And the books are Smyth-sewn hardbacks----not workbooks----printed on acid-free paper that can be used by all the kids and grandkids. The latest Life of Fred Books are: Pre-Algebra 1 with Biology! and Pre-Algebra 2 with Economics! I am so looking forward to doing these two this year with my boys! You can buy Life of Fred Books here. Fifth, because Life of Fred is so much fun, some readers might wonder if it is lightweight. The opposite is true. The Life of Fred is truly complete. I taught for years at the high school and the college level. The Life of Fred: Beginning Algebra book, for example, has more math in it than is normally taught at the college level. Compare Life of Fred: Geometry with Jacob's geometry. 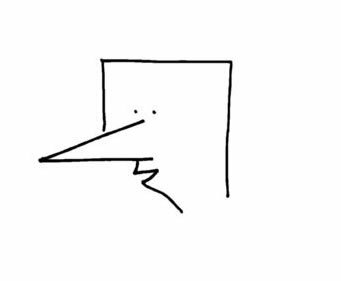 He has about a dozen ruler-and-compass constructions. Fred has 46. Compare Life of Fred: Advanced Algebra with Saxon's (Algebra 2). Saxon leaves out (and Fred includes) (1) permutations; (2) matrices; (3) linear programming; (4) series; (5) sigma notation; (6) sequences; (7) combinations; (8) Pascal's triangle; (9) math induction; (10) partial fractions, which are needed in calculus; (11) graphing in three dimensions; and (12) change-of-base rule for logarithms. Life of Fred: fun, motivating, cheap, clear, and complete. What do you think of this home school math curriculum? Check out more home school math curriculum here.